A few weeks ago, I went to Nashville for the weekend. Even before I left for my trip I knew I was going to need something to help my body recover from the traveling, the not so healthy food I would be eating, and the whiskey I'd be drinking. I tend to not be so careful about my food choices when I go somewhere new, because I love to try the local cuisine. This meant plenty of pulled pork, grits, and biscuits while in Nashville. After I've spent a few days away from my preferred eating habits, I like to do a reset to get me back on track and to remind my body how good it feels when I eat nourishing foods. 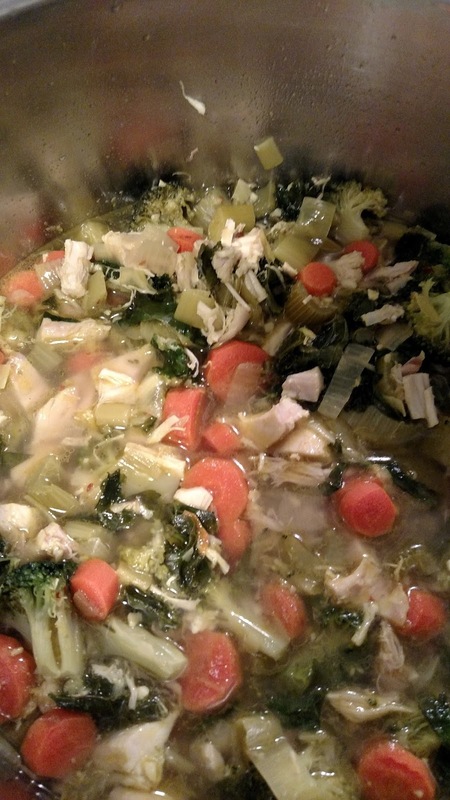 This chicken soup recipe is absolutely perfect for that. It's filled with chicken bone broth, and plenty of fibrous vegetables that get my body back on track. Chicken soup has been used for centuries, in cultures all around the world, as a cure for the common cold. Recently scientists have studied the effects of chicken soup on the common cold and found that it has anti-inflammatory properties. After a weekend of eating and drinking foods that are often thought of as promoting inflammation, an anti-inflammatory remedy is just what I needed. The anti-inflammatory action of this soup is increased with the addition of turmeric and ginger roots. When I make this soup, I purchase bone broth from my local reputable butcher (shoutout to The Piggery!! ), because I simply do not have time or energy to make my own. I combine the bone broth with water and chicken broth powder for flavor. I also purchase an organic rotisserie chicken and break that apart so I can put meat in the soup. This saves tons of time, and makes this whole process much easier. This recipe was inspired by A Spicy Perspective's Detox Chicken Soup. 1. Chop and prepare vegetables. Tear apart chicken meat from bones and chop. 2. Heat olive oil over medium high heat. Add onion, celery, ginger, garlic, and leek to the pot and saute until onions are translucent. 3. Add broth, carrots, apple cider vinegar, crushed red pepper, turmeric, and 1 teaspoon of salt. Bring to a boil, decrease the heat to simmer and cook until carrots are soft, about 15 to 20 minutes. 4. Add chicken, parsley, and broccoli to the pot, continue to simmer until broccoli is soft. 5. Stir kale into soup, adding salt and pepper to taste. Once kale is wilted, turn off the heat and serve warm. I usually double the recipe and freeze half of the pot. This way chicken soup will always be in my freezer when I need it.